Find Face Painting Conventions 2012, including body art festivals in your area. We list many of the festivals and Conventions from around the world. Register for the conventions to learn and meet many of the best artists from across the world. Visit and learn the latest tips and techniques form some of the most skilled teachers. Get to meet and learn from the top artists and people at the conventions and watch them compete internationally, for top honours in various categories. Since 2001, the Face and Body Art International Convention FABAIC, headed by renowned artist Marcela Murad, has been recognized as the original and premier event for the Face and Body Art community. This convention provides a great opportunity to not only learn tip tricks and techniques from award winning artists, but to also expand the number and styles of designs that you can offer both children and adults! Informal painting jam sessions are also going to take place where you can paint alongside other artists from all over the world. Attending a convention is one of the greatest learning experiences you can have. you will be able to learn by watching, asking questions, using your brush and listening to all kinds of advice! Do not forget about the additional bonus of balloon art that will be taught at the convention. And easy and super fun add-on to your face painting business - kids love it, it is easy to learn and a cheap investment to buy a bag of balloons and a pump! You will also have the opportunity to learn how to promote your art, talent and business online with web development classes! It is easy and fun and can be free to make your own website... overcome the obstacle of where to start and get busy using the worlds most popular marketing tool! The Australian Body Art Awards and Convention is the centre of the Australian Face & Body Art community, with a week of National Face & Body Painting competitions. The convention side of the event attracts a great selection of various classes from our very talented Australian and overseas instructors. In 2011, World Champion Body Painter Lucie Broulliard (from Canada) and World Champion Special FX Artist Yolanda Bartram (from New Zealand) as well as the extraordinarily talented Christina Davison (from the U.S.) were judges and instructors. This year Yoland Bartram returns as an instructor and Judge as well as the the gifted Bella Vollen from Austria and Heather Aguilera from the U.S. The ABAA is Australia's Face & Body Painting event of the year!!! The Face and Body Painting community comes together annually to compete for the National Titles that are affiliated with The World Body Painting Association. In 2012 there will be seven competition categories. Face Painting 5 min, Face Painting 2 hours, Body Painting, Costume Painting, UV Body Painting, Special FX and Airbrushing. In addition Show ticket holders are able to view the living canvas unfold as the Body Artists paint their models on Friday 20th & Saturday 21st of April for the competitions. Fridays theme is Cabaret and Saturdays theme is The future. • COMPETITIONS 19th, 20th & 21st of April - Face Painting, Thursday evening. Body Painting, Friday & Saturday during the day. • SHOWS, AWARDS & AFTER PARTIES - 20th & 21st April - Painted Model's stage performance, Awards presentation & After Parties. • THE CONVENTION - 22nd, 23rd & 24th of April - Over 60, 90min classes to choose from. • PRE & POST CONVENTION CLASSES - 18th & 25th April. These are all day classes. Since 1998 the world’s most colourful event has taken place every year in Austria. The “World Bodypainting Festival” is the biggest art event in the bodypainting theme and ten thousands of visitors admire the wonderful work of the participants. Aritsts from 40 nations worldwide come to this unique event and put body art into the mountain and lake scenery. Pörtschach at the lake Wörthersee near the state capitol Klagenfurt is the new location for the next years. Dates: 2 - 8 July 2012. Welkom to the first edition of EFABE. 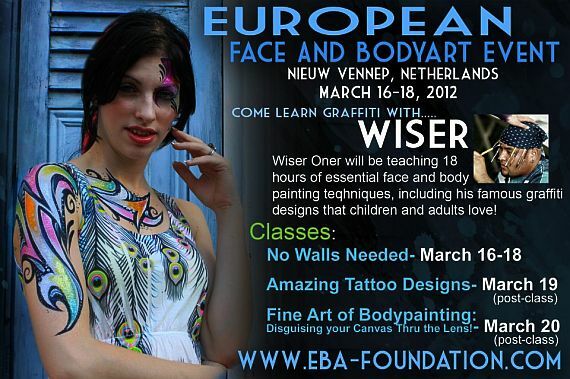 The official European event for all face painters!! EFABE will take place in Samenspel’ in Nieuw Vennep, 20 minuten from Airport Schiphol, centrally located in the Netherlands, so easily accessible for our foreign guests. This weekend will be totally dedicated to following workshops, being inspired, learn new techniques and meet other face painters. On this website you will find everything you need to know about EFABE! And we’ll keep you updated on all the latest news.. You are also able to follow us on Twitter, Facebook and Hyves. EFABE is the newest and most colourful event of 2012! The European event that you just can not miss. We really hope to see you there as well. The Nordic Body Painting Championship, 11th Feb 2012 welcomes all competitors, from all around the world. Everyone can compete and anyone can win. 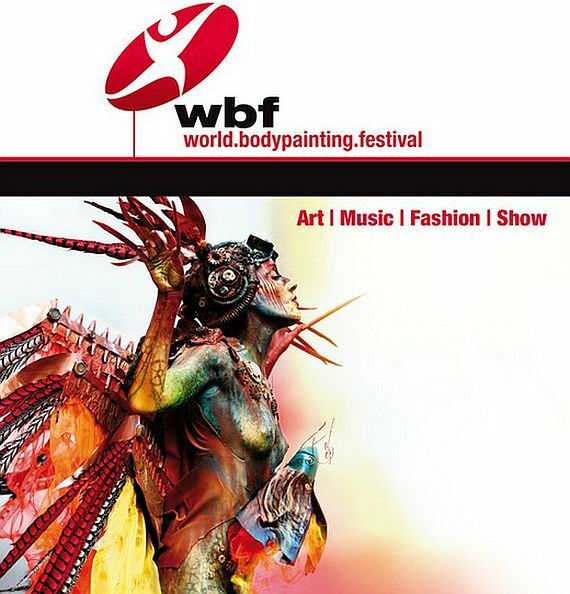 The Nordic Body Painting Championship 2012 will be an open competition i.e. students and professionals compete in the same division. BodyPainting, is the art of using a live human body, as the canvas for the painting, of a non-permanent decorative art piece. Body painting also has the added pressure on the artist that the "canvas" cannot wait for days while the artist relaxes or looks for further inspiration. 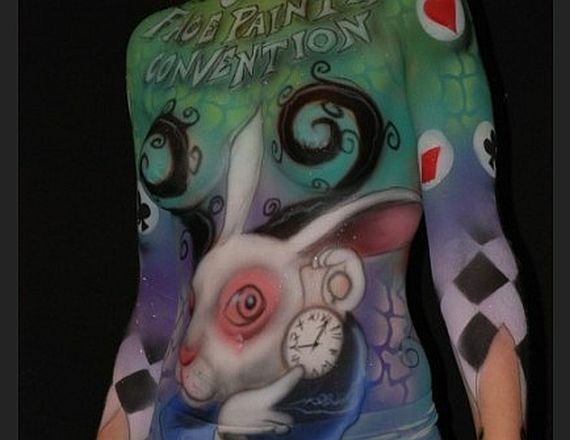 This spectacular Convention is certainly the biggest gathering of face painters in the UK. A fantastic place to learn all the latest techniques, see live demonstrations to further your skills into a new dimension. The re-styled sellers rooms to purchase all your face painting needs, and meet an amazing instructors team. Join in on the many "hands-on" classes, take part in LIVE evening competitions. Also let your hair down at the party of the year! Invest in your skills by booking your tickets now. Please note, this is NOT a public event, tickets available are sold from:- Rainbow Faces Ltd only by calling 01952 60 60 99. Only 150 all-inclusive tickets available for sale and only 50 day delegate tickets per day. Tickets are sold on a first sold basis, monthly plan. To be held over the weekend of May 11th - 14th 2012, the Paintopia venue for 2012 is a stunning country house hotel set in 150 acres of beautiful wooded Norfolk parkland. A truly enchanting event, the whole weekend will incorporate the theme of Harry Potter and the magical Wizarding World. From Friday night there will be lots to join in to kickstart the fun and both Saturday and Sunday are jammed full with lots of Competitions, Workshops to improve your skills and learn new techniques, Painting Challenges and brilliant demonstrations from some top Body Artists.